Today the Iranian cinema enjoys extraordinary fame in artistic and cultural circles worldwide. This was achieved through a few outstanding films presented at international festivals after the Islamic Revolution, notably by Abbas Kiarostami, though it had its roots in the two decades preceding the Revolution. These Iranian films, which deal with ordinary life of ordinary people, have come to be known as the followers of the Human Life Style in film-making. But Iranian film-makers have remained within the same confines, never attempting or daring to attempt to enter the world of commercial cinema. The film industry was born with documentary films made in France and USA. In France, Lumier Brothers made documentaries always attempting to record motion which in those days was what cinema and film-making was all about. Then mechanical engineers and machinery producers became interested in the cinema as a useful tool in their profession, studying and analyzing motion. Gradually film-making spread across the globe and films of all kinds including fiction, such as love stories and adventures, became widespread. Iran's first movie camera was purchased by Mozaffareddin Shah of Qajar Dynasty on a journey to France. Mirza Ebrahim Akkasbashi (the court photographer, picture on the left) was put in charge of operating it. In the first days of 1901 the camera was used to record the arrival of the Shah at Marseille on his way back home with a procession of young girls who offered bunches of flowers to the Shah. But films in Iran, like photographs, faced resistance from religious fanatics who claimed it to be sacrilegious to paint, photograph, or anyhow recreate the faces of human beings. This is why soon it was only Armenian Iranians, and Europeans, Russians in particular, who came to Iran to make films. Then, Indian Zoroastrians of Persian descent and Iranian Bahais who had fled to India for religious reasons, were making Iranian films in India. The films greatly admired those days were mostly of technical tricks such as a hen laying 20 eggs or 100 people mounting one small carriage. 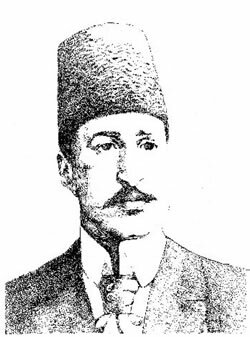 Early in the history of the Iranian cinema Mehdi Roosey Khan (this title was given to him by Mohammad Ali Shah) whose father was English and mother Tatar, became an apprentice to Mirza Ebrahim Khan Akkasbashi and later his successor. 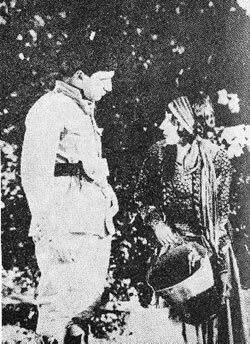 One Armenian Iranian, Avanece Johaniance (or Ohaniance) went to Moscow to study the art of film-making, and in 1929 made the film Abi va Rabi (Abi and Rabi) about a tall man and a small man. Two years later Johaniance made a film titled Haji Agha, Actor of Cinema which dealt with the issue of the dispute between the older and younger generations of the Iranian society over the question of the cinema. The film was made with Asieh Ghestanian and Zema Johaniance as the actresses, and Abbas Khan Tahbaz and Gholamreza Khan Sohrabi and Johaniance himself as the actors, and Paolo Putomkin acting as the camera operator. Other prominent Russian film-makers working in Iran were Smieleve, Jacobson and Sourokopf. Then an Armenian named Ardeshir Khan and Abdolhossein Sepanta made the eternally famous Dokhtare Lor (Girl from Lor Tribe, picture of a scene on the left). Later still, Sepanta made Leily and Majnoon, Shirin and Farhad, Ferdowsi, and Black Eyes. But pressure from Indian film companies forced him to stop making more films. The first cinema theatres opened in Tehran, Rasht and Tabriz. According to Mr Jahanguir Ghahreman Shahi (later called Ghahremani) his grandfather Mr Ebrahim Khan Sahhaf Bashi allocated a part of his garden (behind his shop at Mohanna Crossroads, northern part of Laleh Zar Avenue) to show films. The spectators were mostly nobles, the aristocracy, and wealthy people. About the same time a person named Aghaieve established another theatre in Cheragh Bargh Avenue and later still, Ardeshir Khan, built a cinema theatre in Saadi Avenue. Gradually the number of cinema theatres reached 25 and an intense competition erupted among them. This was the state of the Iranian cinema by 1934-35.